An economic research provides a simple yet powerful model for forecasting who will win the Olympic Games and why. The Olympic Games are much more than a simple sports event. The international consensus around this multi-sport event is one of the rarest in our small yet divided world. I believe the Olympic Games are the only event in which more than 200 countries take place, proudly presenting themselves to the world competing equally under the same rules with matches and fights limited to the different events and with the Olympic spirit prevailing everywhere. I believe the most common question in everyone’s mind during this magnificent event is: Why can’t we all just get along? I’m far from naïve. Politics have always and will always play a major part in such events but there is value to be had nevertheless. The cynics have their criticism of the Olympic Games and we will certainly get a decent dose of it in the upcoming days but hopefully nothing will ruin the festival that awaits us in Beijing this August. Since this is a personal finance and economics blog I thought about presenting a very interesting economic aspect of the Olympic Games. Who wins the Olympic Games and why? Economics has much more to contribute to this question than what might meet the eye. Researchers Andrew B. Bernard and Meghan R. Busse (of the National Bureau of Economic Research and Berkeley University) published a very interesting article in 2002 which tries to answer this question using an economic model. In their research these economists examined the determinants of Olympic success at the country level. Not surprisingly a vast population as well as high per capita GDP were suspected as the main determinants of Olympic success. The benefits of any economic model are its ability to generalize and produce quality results and conclusions from simplistic assumptions and behavior. The model the researches offered is no different. 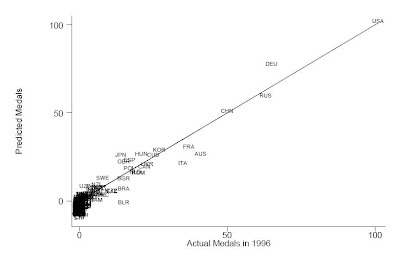 Through generalization the researches offered an answer to the question of how many Olympic medals countries should be expected to win. Population – Larger countries would have a deeper talent pool of athletes and greater chances of fielding medal winners and extraordinary talents. Resources per person – Naturally population is not enough or China and India would rule supreme. The population model is adjusted with the parameter of per capita GDP. Wealthier countries have more resources, research and facilities required to develop top level athletes. Wealthier countries are also able to support more full-time professional athletes. Forced mobilization of resources by the government – Clearly the Soviet Union, at its time, and the Eastern Bloc countries had a share of medals 3% higher than average. Hosting – Interestingly enough host counties were seen to win an additional 1.8% of medals beyond the average predictions. Hosting countries have the home advantage and they spend less on each participating athlete. Another interesting anecdote examined by the researchers was the affect of large scale boycotts on the Olympic Games. The numbers were corrected for two large scale boycotts of the Olympic Games in 1980 and 1984 (These games where held in Moscow and Los-Angeles). Medal predictions for Beijing 2008 keep the USA far ahead with approximately 50 gold medals (11 more than China) and with 100 medals overall. 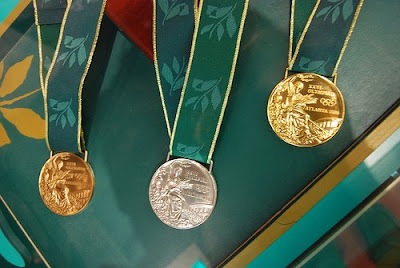 China is next with around 40 gold medals and 90 overall. Russia, Britain and Germany are all in the top five with Australia at the sixth place. It would be very interesting to see what the model would forecast for 2008. Unfortunately I don’t have the data currently available to run it. Still, as the major determinants haven’t changed (even though their distribution has, greatly) I do believe the major results are still relevant. One distinct exception is in fact China which has certainly mobilized its resources towards winning an astounding number of medals (currently estimated at 90).